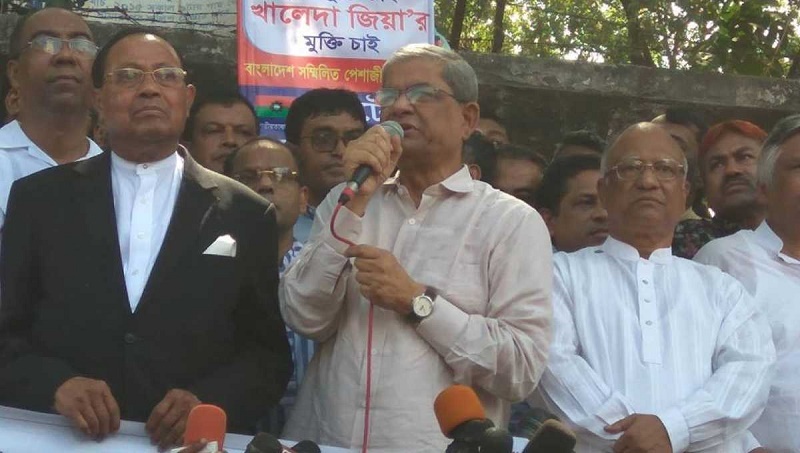 BNP secretary general Mirza Fakhrul Islam Alamgir on Wednesday said no dialogue and election will be fruitful keeping their chairperson Khaleda Zia in jail, UNB reports. A day before Oikyafront’s scheduled talks with Prime Minister Sheikh Hasina, he came up with the remark at a human-chain programme in front of the Jatiya Press Club in the city. “The government on one hand has offered dialogue and extended Khaleda Zia’s punishment on the other. These are two conflicting moves, which don’t demonstrate the government’s sincerity for talks,” Fakhrul said. They chanted various slogans demanding the immediate release of their leader Khaleda Zia. BNP senior joint secretary general Ruhul Kabir Rizvi on Monday announced a three-day countrywide programme, including the human chain, protesting the conviction of its chairperson Khaleda Zia in the Zia Charitable Trust graft case. As part of the programme, the party will also observe a token mass-hunger strike on Thursday in all metropolitan cities and district towns.